Before the sixth and seventh centuries after Christ that body of doctrines and practices which was later called “alchemy” was known variously as “the Sacred Art,” “the Occult Science,” “the Art of Hermes,” or “the Hermetic Art.” The word alchemia or chemia (the direct precursor of our chemistry, Chemie, chimie, etc. ), occurs for the first time, according to a statement of Kopp, in the Mathesis of Julius Firmicius Maternus, a writer on astrology, who lived in the fourth century A.C., and of whose works a number of manuscript copies are still in existence. In this work Firmicius states that if a person is born under the sign of Mercury he will devote himself to the science of astronomy; if under Mars, to the profession of arms; and if under Saturn, to the science of alchemy; the words are “Si fuerit haec domus (i.e., the position of the moon), Saturn, dabit scientiam Alchemiae” (or Chemiae: in certain manuscripts the word is alchemiae, in others chemiae). How did it happen that the term chemia came to denote the science that was at one time known as “the Hermetic Art”? that is to say, where are we to look for the origin of the word? This is a question that has engaged the labors of etymologists for several centuries: and a number of ingenious theories has been advanced in explanation. “The word chemistry in Greek should be wrote chemia, and in Latin and English chemia and chemistry, not as usual, chymia and chymistry. “The first author in whom the word is found is Plutarch, who lived under the Emperors Domitian, Nerva and Trajan. That philosopher in his treatise of Isis and Osiris, takes occasion to observe that Egypt, in the sacred dialect of the country, was called by the same name as the black of the eye, viz., chemia—by which he seems to intimate that the word chemia in the Egyptian language signified black, and that the country, Egypt, might take its denomination from the blackness of the soil. 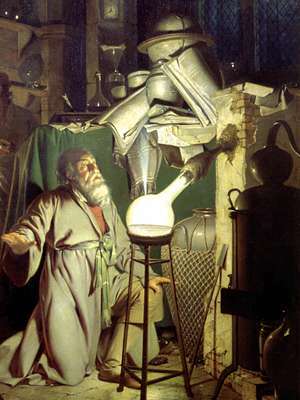 Boerhaave’s conclusion is that chemistry or alchemy owes its name to the circumstance that it was a sacred art, to be treasured as a religious secret by the priesthood, and not to be divulged to the laity. A derivation that enjoyed a long popularity is that of J. Hoffman; according to Hoffmann chemeia comes from chemi, meaning “black,” and refers to an art in the processes of which a black substance was used. This black substance, whatever it may have been, was regarded by the ancients, Hoffman believes, as the materia prima, the primal matter, which the adepts sought to obtain by the ignition, combustion, decomposition, etc., of various minerals. It was also known as the “Black Preparation,” the “Black Stone,” and “Perfect Black.” According to this view, then, chemeia would mean “the preparation of blackness.” It is certain that colors played an important part in the practice of transmutation, and that the various color changes observed at different stages in the process were regarded as indicative of what the alchemist might expect in the progress of his work. Redgrove, in his Alchemy, Ancient and Modern, quotes the following from Espagnet’s Hermetic Arcanum: “The means or demonstrative signs are colors, succinctly and orderly affecting the matter and its affections and demonstrative passions, whereof there are three special ones (as critical) to be noted; to these some add a fourth. The first is black, which is called the Crow’s Head, because of its extreme blackness, whose crepusculum showeth the beginning of the action of the fire of nature and solution, as the blackest midnight showeth the perfection of liquefaction and confusion of the elements. Then the grain putrefies and is corrupted, that it may be the more apt for generation. The white color succeedeth to the black—-,” etc. It is also interesting to note that in alchemical literature Osiris, the Egyptian god of the Underworld (hence, the world of darkness, blackness), is often mentioned as the “Black One”; and the “Black Preparation” is frequently designated symbolically as the “Grave of Osiris,” the “Corpse of Osiris,” etc. The derivation of the word from the Greek is due to the German philologist Mahn, and has been adopted by a number of etymologists. The theory states that khemia or khemeia was probably written for khumeia, denoting a mingling, an infusion, from khymos, a liquid, a juice, especially the juice of plants; connected with this is the work keein, to make flowing, to make liquid, to pour, which is akin to the Latin fundere. If the chymos derivation be the correct one, then evidently, the Latin chemia and the English chemistry should be written, to be consistent with their etymology, chymia and chymistry, that is, as they were written before Boerhave, in the eighteenth century, recommended the mode of spelling which was later adopted and which prevails at the present day. 1 It must be borne in mind, however, that the mediaeval alchemists were ignorant of what they owed to Greek and Egyptian sources. The original Greek texts, from which the Arabians freely borrowed, sometimes through Syriac texts, were not translated into Latin until the sixteenth century and after; Greek was a “dead” language indeed during the greater part of the Middle Ages to European scholars with few exceptions. 2 This idea, that the writings of the alchemists must be understood as allegories dealing with profound spiritual “truths,” and that they did not deal with chemical operations of any kind, in other words, that there was a “spiritual” alchemy distinct from what is ordinarily known as alchemy, has been found to be untenable, and is now maintained by a few extreme theosophists only.